As ever, in this feature packed issue Volume 10 Number 3 of HIFICRITIC there is a fantastic compendium of reviews and features, not least our strong coverage of the latest jazz, pop and classical music issues, plus our regular guest spot where an industry personality reveals their favourites. It is something of a big speaker issue including four massive floor standers. 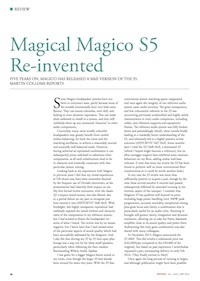 Pride of place is our exclusive coverage of the new Magico S5 MK 2, where we take it to bits both sonically and in the laboratory, and find out whether this company's ambitious claims for the advanced technologies used are met. There was so much to discover that it took 8 pages and three months to complete. 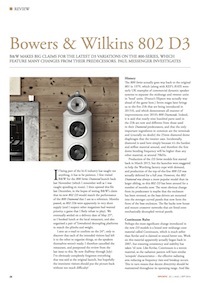 But three more fine loudspeakers grace our pages, the undoubtedly accomplished B&W 802 D3, the authoritative Spendor SP 200 with double 12inch bass drivers, and the latest from the BBC studio monitor builder Graham Audio, namely the massive Derek Hughes designed VOTU , 'Voice Of the Universe' , ambitious stuff this. We also cover a delightful Danish made miniature from Dynaudio, the EMIT 10. That could have been the end of our loudspeaker coverage, but there is another, this included in the massive Audionote feature review by audio legend Chris Frankland, here the Audionote AN-J Lx. And yet another is found, included with the ultra compact NVA system, I thought that was the lot until I remembered the ATC SCM20 stereo pair working with a two, spaced, super power JL Audio Fathom sub woofers for genuine 20Hz power bass. Finally we take a look at the rare and little remembered KEF Carlton from 50 years ago, the design with the huge 18 by 14 inches, yes inches! , bass driver, this in a sealed box enclosure. 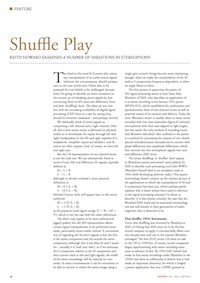 Our headphone coverage includes a full investigation of the tube equipped iFi PRO iCAN headphone amplifier, with stereo image processing, and this subject is taken up in depth in expert Keith Howard's fascinating feature on historic and more recent stereo signal processing systems, aimed at more realistic and stable imaging. 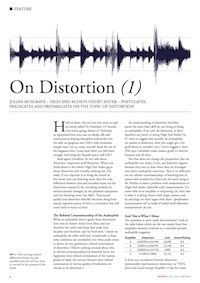 By coincidence Stan Curtis experiments with something similar in his thought provoking feature on headphone listening. We cover Audioquest Jitterbugs in various quantities and with several DACS including all the Dragonflies, and with the Meridian Explorer II MQA, no less. We should not forget the Vertex Pico vibration control, the SLiC Innovations Eclipse C mk2 interconnect cable plus the Enklien David Digital, nor the short feature on Loudspeaker Dynamic Range and not least Julian Musgrave musing extensively on distortion. And then there are Audience OHNO III loudspeaker cables which our editor rather liked. Finally there is Richard Dunn founder of NVA with his direct sale system comprising the P20 power, the A20 control unit and those Cubette speakers at £650 complete.